In 1833, a Protestant Pastor named Friedrich Muench from Nieder Gemünden, and an attorney named Paul Follenius from Giessen, Germany began to dream of emigrating to the United States. They published a small pamphlet “A Call for a Large Scale Emigration” to the United States, with plans to create a German State in America. With a goal to gather enough German emigrants together to eventually reach the goal of 60,000 signatures necessary to create a State, they formed the Giessen Emigration Society that September. They sent two agents to scout out the Arkansas territory. Thousands applied to be part of the group. The following spring, Paul Follenius was gathering those that would sail on the ship the Olbers, which would take over 250 men, women and children from several parts of Germany. There were doctors, lawyers, teachers, glove smiths, tanners, farmers; and they were Catholic, Evangelical, Lutheran, Jewish and Free Thinkers. As they readied to depart for New Orleans, the agents returned with word not to settle in Arkansas. Plans were suddenly changed and Follenius sent word to Muench, who was held up in Nieder Gemünden, to “meet him in St. Louis” in the young state of Missouri. Follenius’ group encountered typhoid and cholera and lost several of its’ members. Muench arrived in Bremen and found that the ship chartered for his group was nowhere to be found. Unable to go back or forward, and needing funds to travel and settle in the United States, he arranged for a stay that lasted weeks on Harriersand Island in the Weser River, between Bremen and Bremerhaven. He became anxious and morale suffered and some even changed their plans. It would be weeks before he was able to charter the Medora to sail to Baltimore. Muench would lead his group, also from all walks of life, through Cincinnati where he encountered Johann Wilhelm Bock, coming from Dutzow. Muench learned that Follenius’ group had settled near him, where Duden had lived, in Missouri. Meet the Traveling Summer Republic in Missouri at the Missouri History Museum in St. Louis on November 22, 2014. 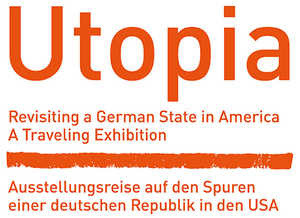 Their exhibit Utopia – Revisiting a German State in America will open and share the entire story of these 500 Germans who came in search of freedom and democracy, creating a German state in America. This exhibit was created in Germany and shares the history of these early emigrants.